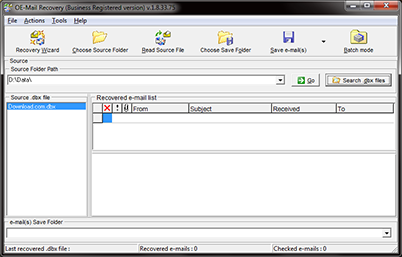 OE-Mail Recovery (download) is a special software product for viewing dbx files - a DBX Viewer or DBX explorer. Unlike other dbx viewers or dbx explorere, OE-Mail Recovery serves for reading damaged dbx files. The program reads a dbx file of Outlook Express, identifies e-mails and messages stored in the file, checks their integrity and only then includes the message into the view list. The distinctive feature of the dbx viewer is that it does not delete or modify source dbx files. The .dbx viewer can read files larger than 2 Gb, the maximum size of a file that the dbx viewer can view is 4 Gb. 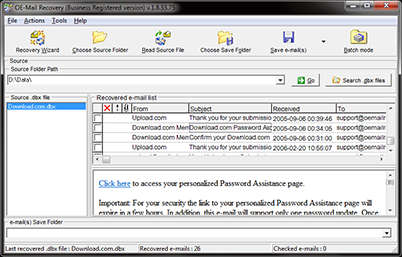 The dbx viewer can also view messages that were deleted from Outlook Express folders. The dbx viewer allows viewing the header and body of a message. DBX explorer don't allow to use an attachments, customer should move a recovered messages back into Outlook Express to use a recovered attachments. Read a dbx file using the .dbx viewer. Save the e-mails and messages you find to the disk. Create the damaged Outlook Express folder anew. Move the messages you saved using the .dbx viewer to the Outlook Express folder.